This latvian oddity is a different kind of beast to encounter, effortlessly combining post-rock, drone, metal, brass instruments and ambient with movielike atmospheres. Atmospherically somewhat resembles Noir by Callisto, but musically Nekavējies, Šīs ir Spēles Ar Tevi is much more experimental and drone. Unlike many other droniacs the melodies here are almost uplifting even though the songs are usually very slow. Still the melodies rarely wander deep into melancholy or impenetrable heaviness. Playfully crooked, surprisingly soft under the surface; bursting with distortion. Often almost ambient. 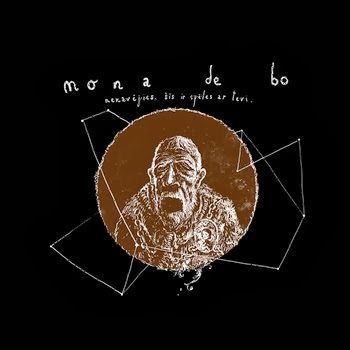 Mona De Bo really does not spare the use of guitar-distortion, even the clean melodies are usually entwined with distortitive waves. Unlike Sunn O))) distortion is used with the guitar INSTEAD to replace the guitar. Wall-of-sounds are sparse on Nekavējies, Šīs ir Spēles Ar Tevi. It does not disguise itself behind 16 tons of guitarwall, a refreshing feat. I even deeply adore the drone-ambience of Dejosim! that teethers on the verge of cracking for minutes but never pinnacles unlike Priekšpēdējais. With Mona De Bo it’s much more about the journey than about the destination. Just please ignore the cover art: a 70 year old hobo vomiting its entrails off.